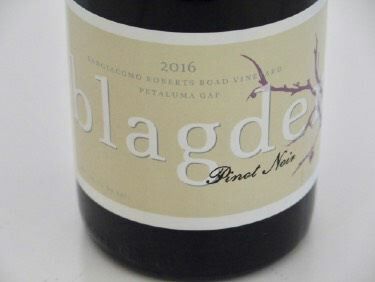 Winemaker Catherine Blagden and assistant winemaker Thomas Brocker are both University of California at Davis graduates who have worked with Greg LaFollette on several small Pinot Noir and Chardonnay labels before launching their own label in 2006. Catherine has an impressive resume that includes working on many small artisan labels such as Tandem, Dunah, Londer, Halleck, Sapphire Hill as well as starting the Soliste label and launching a Sonoma Coast project for Luna. She has spent a harvest at Flagstone in Cape Town, South Africa and Domaine Dujac in Burgundy. Pinot Noir and Chardonnay grapes are sourced from one of the Sangiacomo Family Vineyards Roberts Road Vineyard located in the Petaluma Gap. A Monte Rosso Cabernet Sauvignon is also produced. Blagden can afford to hold the wines for release until they are ready. In early 2015, her current releases of Pinot Noir and Chardonnay were from the 2008 vintage. The wines are made in a custom crush facility in Santa Rosa, California.